The garden of the Sheraton Jumeira Beach hotel resembles an oasis in the desert. Green grass and palm trees create a luxurious atmosphere and the cool sea breeze adds to the pleasant feeling. In fact this is a double oasis, both in terms of the sand desert and the brick and concrete ‘desert’ surrounding the hotel garden. The coastal front here at the Jumeira beach in Dubai reminds me of the Atlantic wall at the Belgian coast, but the buildings here are at least twice as high and with space between each and every one of them. Between those very high-rise buildings and the sea there is not only a white sandy beach, but also a winding walkway with low-rise restaurants with all kinds of food and shops, so there is more air, making it a pleasant place to stroll away from the crowds. The shops sell many luxury items but it was a surprise to realize that fur coats are popular ladies in the desert. Dubai is a place to visit in spring or autumn, when temperatures vary between 20 and 35 degrees centigrade, leading to cool mornings and evenings, with nice warm, still not too hot middays. Avoid the summer because then it is really too hot here, with midday temperatures easily climbing above 40 to 45 degrees centigrade in the shade. 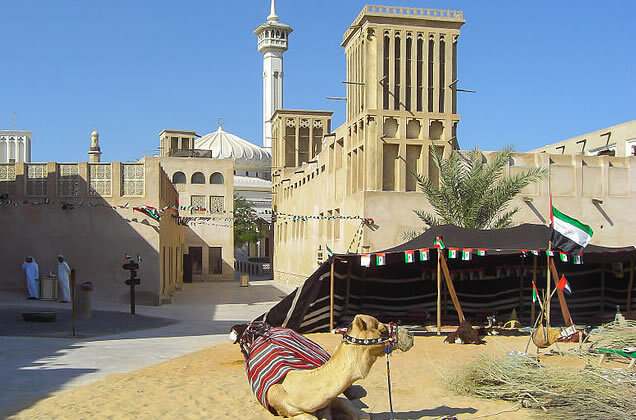 There are many attractions in Dubai and taxis are not very expensive. The Burj Khalifa, the tallest building in the world at over 800 metres high (2.5 times higher than the Eiffel tower) is the city’s landmark. ‘Normal’ skyscrapers, at more than 100 metres high, are dwarfed by it. Around the Burj Khalifa there is an immense shopping centre with an aquarium, an ice skating ring and 1,200 shops. Next to the many restaurants there also is a huge food court where you can dine outside with a view of the Burj Khalifa. Khalifa and his surroundings, if only for my son to try the A380 flight simulator. It is remarkable how the city of Dubai continues to advance in terms of modernity and efficiency. We took the sky train from the Jumeira Lakes, where our hotel was located, all the way to the old centre of the city. Deira, with its many souks, is a big contrast whether for commerce or for living with the new high rise quarters or the artificial islands that have made the city so famous worldwide over recent years. make you realize how big such boats really are or how small a creature we humans are. No trip to Dubai is truly complete without a trip through the desert. The sand dunes in the neighbourhood of Hatta are particularly high and nice to visit. In ancient times such trip would have been done by a camel caravan – these days you take an air-conditioned jeep convoy. To our delight, we were taken there in a red Hummer. If you have an experienced driver who knows what he is doing, dune-bashing is great fun for all because there are no abrupt shocks, only smooth but fast gliding over and against the dune tops. In fact, I prefer to call it sand-wave-riding as I do not want to bash anybody or anything. The dunes do not seem to mind at all – they return to their pristine forms in no time with the wind. After the dune ride you can continue your trip, camel riding, henna painting, or watching belly dance performance watching whilst eating a buffet dinner in a Bedouin camp surrounded by sand hills. If you like peace and quiet you can even stay there for the night in a tent. My last day in Dubai: I enjoyed the beautiful white sandy beach, the clear and calm water, the clean stretch with kilometres of white sand. It is rarely very busy on the beach, so you can walk the length of it and back. On the dyke next to the inlet to the Dubai Marina, you have a clear bird-eye’s view of the entire Jumeira Beach, including its low-rise restaurants and shops, with the high-rise towers in the background. That evening my family and I went for a walk around the Dubai Marina or at least part of it. From one of the bridges crossing the Marina there is such a great view of the pleasure-boat harbour. Dubai, I will definitely be back, my family too.